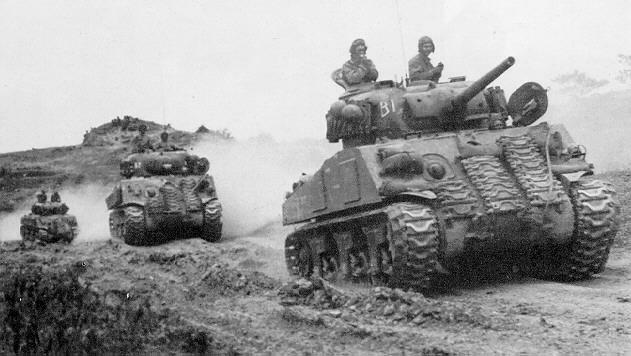 We take a look at the development history and features of an engine that powered the M4 Sherman and other vehicles. 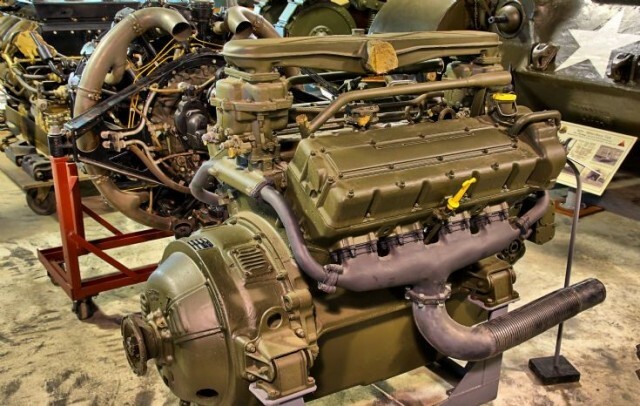 Starting life before World War II as a 27-litre V12 designed for aviation purposes, the Ford GAA would eventually becoming a world-class V8 for both military and civilian purposes. It was originally designed as a V12 on request from Henry Ford. Anticipating the start of another world war, Ford set about designing an engine better than any competing designs. It was highly likely a big market for high performance lightweight engines to power fighter aircraft would open up and Ford wanted the contract to supply them. He started work on a V12 to beat Roll-Royce’s distinguished Merlin engine but with the same 27-litre displacement. 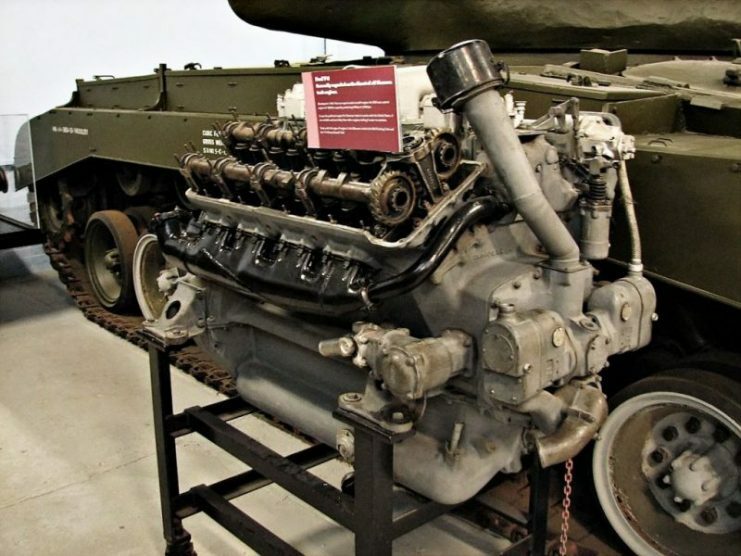 To win, the engine would need to be more advanced and be more powerful than the Merlin. After completing his design, Ford presented to the Air Corps a 27-litre all aluminum 60-degree V12, with four cams and forty-eight valves. The engine had some truly modern features for the time. Henry Ford was so confident he would win a major contract he already had the tooling and casting cores ordered for its manufacture. The prototype was much more advanced than the Merlin or the older Allison, pushing out 1800hp on its first test run. But to Ford’s dismay it was the Allison V12 that was preferred, due to it having been around for a number of years previously, with many spare parts available and the men trained on repairing and maintaining it. These were major considerations that would win the contract for Ford’s rival. All was not lost, however. 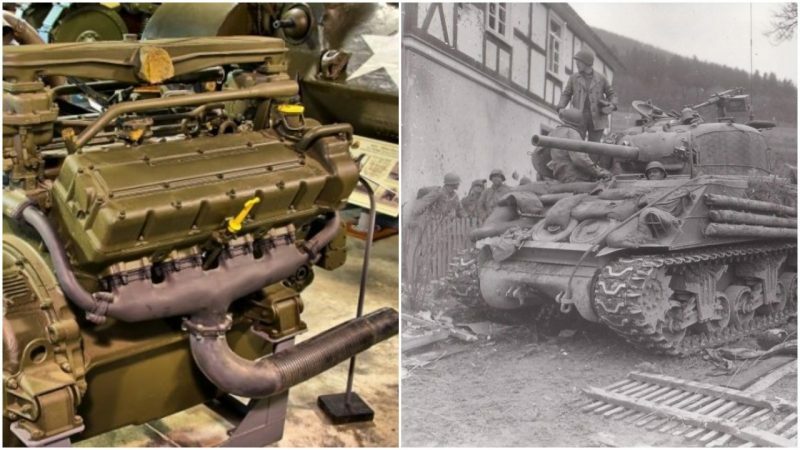 The Tank Corps were in need of a V8 to power their Sherman tanks so Ford were approached to resolve the problem of engine supply. Ford removed four cylinders from the unused V12 casting cores to make an 18-litre V8. To speed up assembly and supply of this new engine, they simply retained the same design from the V12, keeping the 60-degree angle and its all-aluminum construction. 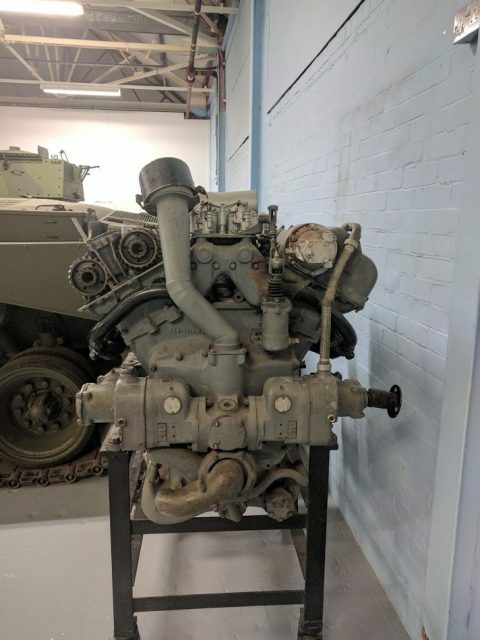 The V8 looks easier to work on than the multi-bank that was used in Shermans. The Ford GAA, the largest petrol V8 in history, was born. For its time the GAA was a marvel of engineering. Due to its military role it had no belts or chains whatsoever, everything was gear driven for durability and to reduce maintenance. There was a power divider to drive the cams, distributors and pumps. A rare sight on engines at the time, its spark plugs were located centrally in the combustion chamber allowing for a more complete detonation of fuel. It was a true Double Overhead Cam engine with two exhaust valves and two inlet valves per cylinder. A 198lb flywheel was used to smooth out the firing order of the huge engine. The GAA’s capabilities were regarded as under used powering tanks, never being properly pushed to its limits in this role. The 18-litre V8 produced 500hp at 2600 rpm, producing a monstrous 1400nm of torque at idle. It was designed to live at low rpms to keep sustained powerful output. Due to this an governor had to be installed with the limit set at 2600 rpm. Crews of the tanks with this engine were known to remove the governor to increase rpms and allowing more power in dangerous situations. However without the limiter a stock engine would rev to 3800 rpm before the valves would stop following the contour of the camshaft lobe, and begin to float, known as valve float. If this happens the valves are no longer strictly controlled by the cams, and can cause a piston and valve to collide. An odd feature was the two carburetors being mounted at opposite ends to each other on the engine, making the fuel-air mixture much richer at the end cylinders compared to the central ones, often fouling the outer spark plugs more quickly. The GAA V8 Provided a brilliant service on the battlefield and proved itself and soon after the war ended when the engines began coming into civilian hands. Because of its extreme reliability and low sustained rpm the engine was ideal in industrial roles such as in oil fields, trucks and boats. After people began tinkering it was discovered that the engine’s true potential was relatively untapped in its standard form, having massive capabilities for increased horsepower and torque, especially when used with a turbocharger or supercharger. It was found that stock pistons were good up until around 1200hp at which point the rings began to fail. The pistons themselves can crack with moderate boost pressures. Modifications such as replacing pistons and valve springs, balancing moving components and adding direct injection and turbocharging, can give a sustained reliable output of 2200hp. Noticing this, the engine became popular on drag strips where it performed so well it was subsequently banned from competing in the 1950s. More recently, tractor pullers have managed up to 5000hp for shorter durations. The Ford GAA was rushed to service, but over its lifetime served many different interests, proving the adaptability of the engine. From its unequalled reliability in combat, to pushing over double its standard horsepower with stock components it really is a testament to Ford’s ability at constructing a solid engine.